Powers/Abilities: An inventive (albeit incompetent) genius, Benedict built a faulty "growth ray"; following his exposure to the rays of the device, he was transformed into an immovable, stone-like "statue". 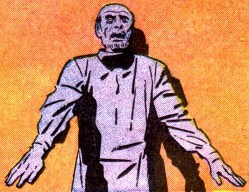 (Tales to Astonish I#34/2 (fb) - BTS) - The past of Luther Benedict is unknown, but he spent years working on a growth ray. (Tales to Astonish I#34/2) - Benedict completed his ray and was ready to test it. He placed a common frog under the beam and attempted to enlarge the animal to twice its normal size; but instead, the frog took on a rigid, stone-like appearance and became an immovable “statue”. Feeling bitter failure, Benedict glanced at a newspaper headline regarding the sale of a life-like sculpture, and got an idea how to use his failed invention: he could make a fortune creating realistic-looking “statues” by transforming people into stone! Benedict placed a classified ad in a newspaper for a sculptor's model, specifically requesting one with no friends or family (i.e., one who would never be missed), to come to his house for a modeling session. A blond model answered the advert, and when she arrived at Benedict's home, she knocked on the door and walked in when Benedict's voice invited her inside. As the model entered the darkened house, Benedict focused the rays of his machine on her and turned her to stone. When Benedict turned on the lights and looked at the “statue”, he saw how beautiful she was and immediately fell in love. Determined to bring the model back to life, Benedict theorized that a second ray exposure would restore his inanimate inamorata back to normal, so he refocused the ray; but as he reactivated his machine, he failed to notice a full-length mirror hanging on the wall behind his petrified paramour. The rays hit the mirror and were reflected back at Benedict, transforming his atomic structure to lifeless stone, even as the lithoidal lovely was returned to flesh and blood. The model revived and saw that there didn't seem to be anyone else in the house except for a strange-looking "statue" (Benedict), so she left with no knowledge of the events that had transpired, while the hapless statue maker was left to his strange fate. Comments: Created by an uncredited writer, Jack Kirby (penciler) and Paul Reinman (inker). 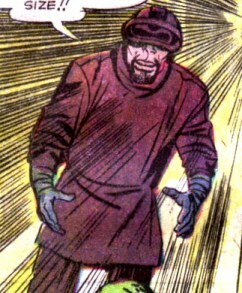 With his beard, and wearing that protective helmet and goggles, Benedict looks a little like Mentallo (Marvin Flumm). In Marvel Team-Up I#13, the Grey Gargoyle (with the help of A.I.M.) launched a satellite into orbit that had a ray-projector similar in function to Benedict's ray. 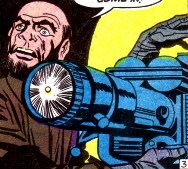 The petrifying effects of Benedict's "growth ray" remind me of the "petrifactor" used by the D'bari explorer Vuk (@ Avengers I#4)--my guess is that when Benedict was building his ray machine, he connected some circuits wrong and inadvertently created something akin to the D'bari device. Benedict didn't indicate if there was any time-limit on the transformation brought about by exposure to the rays, so we can probably assume that both he and that frog are still "stoned". The model was never identified in this story, but I think she should be named "Dawn Bailey" (in honor of the two most beautifulest goils I've ever knowed). Maybe after this modeling assignment fell through, she got a job with the Hanover Modeling Agency (which also employed Millie Collins ("Millie the Model")). And a BIG Thank You Jim Sharpe to for the scans! This story was reprinted in Monsters on the Prowl I#30 wherein the model went from blond to brunette. A device built by Luther Benedict, the growth ray's intended purpose was to increase the size of living beings; however, after his initial test on a frog, Benedict discovered that the rays of the projector only petrified living tissue and left it in a stone-like state. A second exposure to the rays would return the subject to normal with no ill effects. An attractive model was temporarily transformed to stone by Luther Benedict's "growth ray". When Benedict saw how beautiful she was, he fell in love with her and was determined to bring her back to life, so he reactivated the machine to return her back to normal (with unintended consequences to himself).